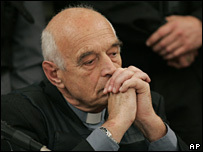 The Roman Catholic priest, Christian Von Wernich, will spend the rest of his life in prison following his conviction for involvement in the murder of seven people and other serious human rights violations during military rule in Argentina. Justice has been done, but the case is likely to raise as many questions as it answers. 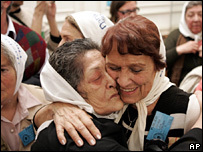 Shortly after the sentence was announced in the city of La Plata, and while human rights activists and families of the victims were still celebrating, the Argentine Catholic Church authorities spoke about the case for the first time. They urged Father Von Wernich to move away from impunity and hatred, and to repent his sins. The parish where he worked said it would consider suspending him for life from his duties. What was there to consider, asked one national newspaper. Father Von Wernich, who served as chaplain to the Buenos Aires provincial police force, showed no signs of repentance as he spoke before the verdict was announced. He threatened witnesses, telling them that giving false testimony was the work of the devil. One of the witnesses at the trial, Carlos Zaidman, was a victim of torture in La Plata and spoke about his feelings when he saw the priest again many years after the end of military rule. "At first I was stunned," he said. "Disgusted to see how this person had recycled himself again." "He'd been giving mass, doing exactly the same as he had been before the dictatorship. It was as though nothing had happened... like in this country absolutely nothing had happened." 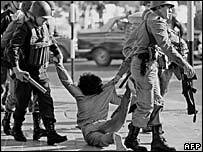 Many priests and church workers were victims of the military government in power in Argentina between 1976 and 1983. Some were among the estimated 30,000 people killed. However, most critics say the Church hierarchy and many priests at best stayed silent on the killings and at worst openly collaborated. Until Tuesday's verdict, that was only an accusation. One of the prosecution lawyers, Myriam Bregman, said Father Von Wernich's case was only the beginning. "The importance of this case is fundamental because it's judging the participation of civilians in the military dictatorship," she said. "And not just any civilian, but a member of the Catholic Church - an institution with a lot of weight in Argentina." "Out of the Von Wernich case we've learnt not only about the collaboration of this police chaplain, but also of other eminent members of the Church during the military dictatorship." 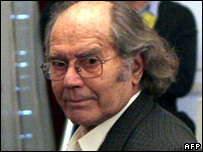 The most high-profile witness during the three-month trial was the Argentine Nobel Peace prize laureate, Adolfo Perez Esquivel, himself a prisoner under military rule. He declared in court that he had told Pope John Paul II personally that the military was kidnapping the babies of women prisoners. "The Pope put down the information I'd given him," he said. "Then he told me: 'You also have to think about the children living in communist countries.'" "I said: 'We have to think about all the children in the world, but these are children kidnapped in Argentina by a dictatorship that calls itself Christian and Westernised.'" A Catholic lay worker, Gabriel Bicinskas, said that many ordinary church workers did fight for human rights under military government. "In this case, we've adopted the line we've always had, which is to raise our voices, leaving nothing out, hiding nothing, expressing exactly what we believe about human rights at any given moment," he said. Mr Bicinskas said the Catholic Church in Argentina had spoken with many voices and perhaps could have spoken more strongly with one voice. While the Church is still one of the pillars of Argentine society with millions of devotees, there is little doubt that after 24 years after the end of military rule, many view it with contempt and suspicion. Senior figures in the Church have said publicly that it should have done more. President Nestor Kirchner once asked: "Where were the bishops when children were disappearing here?" After military rule ended in 1983, civilian governments granted amnesties and pardons to the torturers and killers, a move ruled to be unconstitutional 20 years later. As a result, the trials resumed last year and Father Von Wernich was only the third person to be convicted of human rights abuses since then. Many of the perpetrators of what became known as the "Dirty War" have died. All of those still alive are old. The wheels of justice move extremely slowly in Argentina and it is unlikely that too many more will appear in court. As well as putting Father Von Wernich behind bars, this case has again focused attention on the Church hierarchy in Argentina and beyond, and the pressure is now on them to answer some difficult questions.